THIS EVENT HAS BEEN CANCELLED. PLEASE CONTACT THE COMMONWEALTH CLUB FOR FURTHER INFORMATION. In September 2017, Hurricane Maria wreaked havoc on the Caribbean mere weeks after Hurricane Irma swept through the islands. Puerto Rico was devastated, with the overall damages leaving millions without food or water and the largest power outage in American history. 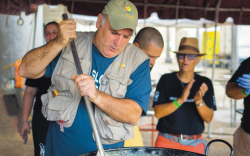 In José Andrés’ newest book, We Fed an Island: The True Story of Rebuilding Puerto Rico, One Meal at a Time, the acclaimed chef details the story of how he and his nonprofit World Central Kitchen made it their mission to repair Puerto Rico through his favorite medium: food. Andrés, with the help of a local network of chefs, volunteers and community members, made nearly 3 million hot meals during his time in the country, and he passionately rallied for disaster relief that was both urgently provided and free from bureaucratic red tape. Despite the obstacles put in the way by government agencies and large organizations, Andrés not only fed thousands of people but also provided a framework for what humanitarian relief should look like, and he continues to be a powerful advocate for this important work.